For busy entrepreneurs, sitting down for a hearty breakfast sounds like something out of a dream. Despite research that eating breakfast improves cognitive function, regulates mood and may even decrease diabetes risk, a 2011 study showed as many as 31 million Americans skip breakfast. Dian Griesel, nutrition expert, entrepreneur and author ofTurboCharged Recipes (Business School of Happiness Inc., 2012) is always on the lookout for fast, on-the-go foods that travel well and says planning your first meal of the day is the best way to avoid unhealthy eating habits later in the day. "Once you're out of your house, the first thing you'll do is grab an 800 calorie muffin because you're hungry," she says. Here, she offers her top five breakfast foods on the go. 1. An apple or bunch of grapes. Fruits such as apples, grapes and berries are not only nutritious but pack a powerful hydrating punch. While hydration is important throughout the day, Griesel says it's crucial in the morning. "Overnight, your body has been working on eliminating. It's drawing water from all of your systems, so when you wake up in the morning, you're dehydrated," she says. Eating hydrating fruits will help promote a better digestion, reducing that sluggish feeling in the mid-afternoon when your overly dehydrated body begins to get backed up. Apples are not only hydrating, but are a great source of fiber, which also helps promote healthy digestion. You don't need to sit down at the breakfast table to eat eggs. Throw scrambled eggs in a tortilla wrap as you head out the door. Hard boiled eggs also travel well and are a great way to get your kick of protein in the morning. "You could make a dozen hard boiled eggs and keep them in the refrigerator and they'll be ready to grab and go," says Griesel. A protein-rich breakfast may help stave off hunger and reduce unhealthy snacking on high-fat and high-sugar foods in the evening, according to a recent study published in the American Journal of Clinical Nutrition. 3. Dates and nut butter. Rather than grabbing a sugar-laden Danish at the coffee shop, one of Griesel's favorite breakfast foods are dates stuffed with nut butter. Slice the date in half, remove the pit and add a spoonful of nut butter. "It tastes rich like a caramel," she says. Dates are great mood-balancing foods. "It has all the mood-supporting vitamins [such as B vitamins] that support emotional balance," says Griesel, and are also an important source of calcium. Snack-size portions of Greek yogurt make for a great breakfast on-the-go, but Griesel says you can get even more nutritional value from your yogurt breakfast with a little prep time the night before. Crush up your favorite nuts in a food processor or blender and place them in a small baggie. Add a little cinnamon for an antioxidant boost, then dump the nut and cinnamon mix into your package of unsweetened Greek yogurt for a nutrient-dense, high protein breakfast that will last you all morning. Nuts are particularly great at staving off hunger, helping you to cut back on those mid-morning cravings. 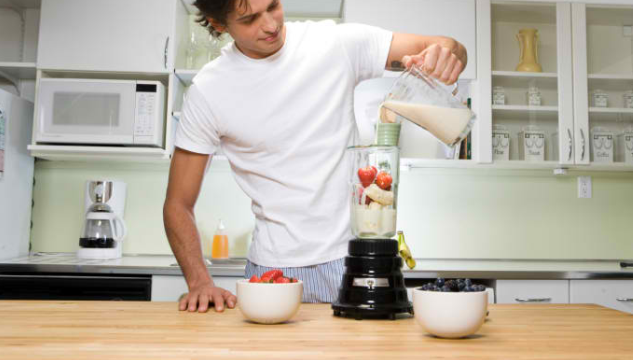 Swap your coffee cup for a nutritious smoothie. Using water or orange juice as a base, add a banana and any other fruits you have available. Frozen berries are great to keep handy for smoothies. Add some yogurt to make your smoothie creamy and for an extra dose of protein or a scoop of nut butter and throw in some fresh coconut which contains essential fatty acids that are important for brain health. "It's inexpensive, hydrates and gives super high nutrition per calorie," says Griesel.